Go ahead…Take a Dip in your car! – Piper Speaks Promo – Advertising that Lives On! Go ahead…Take a Dip in your car! Will DipClip Be The Next Big Promotional Product? If you have ever scarfed McNuggets while in traffic, or wolfed down a Whopper in a parking lot in between sales appointments, you’re going to want to read this. 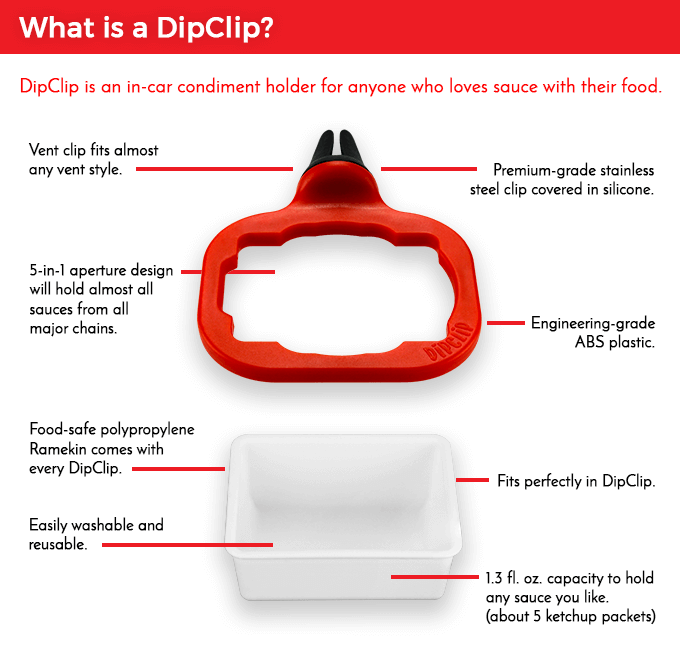 The geniuses – yes, we’re declaring them geniuses – at Milkmen Design have come up with a product called DipClip. 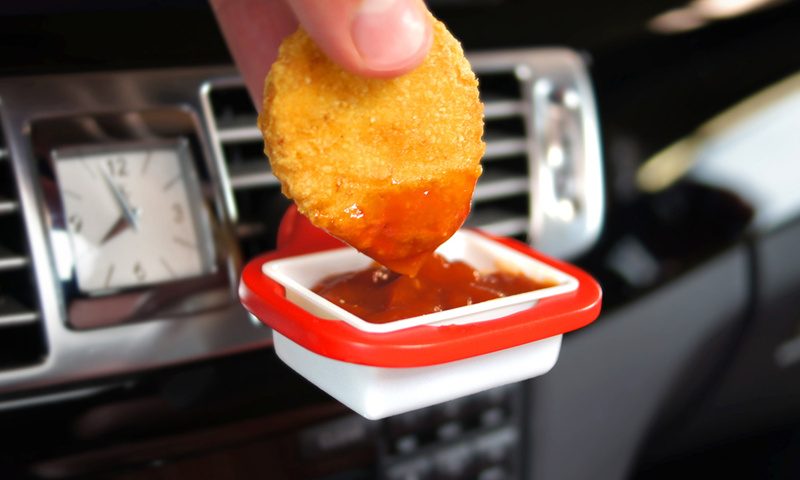 Basically, it’s an in-car condiment holder for folks who enjoy dipping sauces when getting down on transit noshing. Brilliant in its simplicity and practicality, the DipClip consists of a clip that attaches to vehicle vents. Into the clip’s 5-in-1 aperture design, there fits a food-safe polypropylene Ramekin that holds 1.3 fl. oz. – about five packets of ketchup. Of course, if ketchup isn’t your thing, you can also drop in other condiments, anything from barbecue sauce and mustard to hummus and salad dressing. Folks, these guys are humanitarians. While the fast food gods have clearly inspired this ingenious invention, the reality remains that the DipClip is still in Kickstarter phase. As of Friday morning (Eastern Time), the DipClip campaign had blown past its Kickstarter goal of $10,000 and exceeded $48,000. The campaign was scheduled to run through January 5. Once DipClip becomes commercially available, we could see it potentially being a much sought-after item in the branded merchandise space. It’s a product anyone who drives – and eats – could use. It would be displayed in a high-visibility area where recipients are daily – their cars. And we’re guessing it’s not going to be super pricey. While the clip doesn’t have a lot of surface area for branding, the Ramekin could hold a logo and appeal to a range of end-clients – from fast-food chains themselves to auto industry clients. With DipClip, commuting just got tastier, and promo pros may one day reap sales from that delicious fact.